This entry was posted in Suggestions by Nigel Hamilton. Bookmark the permalink. I can’t get the app to recognize my AirPrint HP Deskjet 3512! Any suggestions? I’ve tried restarting it and that doesn’t work. I can’t get the list to print from my iPhone 8 or IPad. Hi Lori. Have you checked that the printer is on the same wireless network as the iPhone/iPad. Are you able to print from a different app e.g. Mail? Can you email the labels file to a computer and print from there? I have imported names from my contacts and have edited names to put a couple onto one label. But cannot edit the address. The address in my contacts has United Kingdom as the last line which I don’t want to be printed. It seems to be impossible to delete this line in contacts. Hi Helen. There is a setting in the app to stop the country getting printed on the labels (as long as the name came from Contacts). Please contact me on support at support@ios.addresslabels.app for help with this. Thank you. I found it, when I went to print stage. Is this supposed to work on a Mac? Where is the edit button? Waste of money so far. No it is actually an iOS app. There is a Mac version of Address Labels on the Mac App Store. Hi Nigel, it keeps getting better and better! You have done a masterful job. I would love to run this on my Windows PC, import or export to Excel or Numbers, include other Contact fields, etc. Currently I am looking for a way to track cards sent and received across the years. Maybe I could put something in the Contact notes. I know I can track one year at a time group by group but it would be great to merge years. Can we have it on Android please!! Why can’t we back up our data to iCloud? When I first added the backup feature, I was trying to use the Apple iCloud. I thought it was the obvious way to go. At that time, I was struggling to get it to work properly. I looked for help on various forums for developers, and there were a lot of warnings about using the Cloud. In fact, the main advice was to avoid it as it was causing data corruption, data losses etc. I was surprised, since I knew things like Contacts seemed to sync with no problems. But what I read tied in with what I was experiencing with the app. So I took the advice and went the dropbox route which was thought to be more reliable. I’m not sure, but I think Apple have made big improvements to iCloud syncing etc. since then. I would definitely like to add it in the future though no promises. So I do understand why you would ask about this, and it does nag at me that I haven’t added iCloud. Perhaps I will eventually. This app works great. I like the options. But my addresses to not line up right. I even have addresses printing on two labels.. I think you should add the ability to pick the specific brand and type of labels so it does line up right. Also, My printer always prints to tray one which is 4×6, unless the app allows me to choose. I’m not sure if that something you can do, but it would be nice to specify the tray. 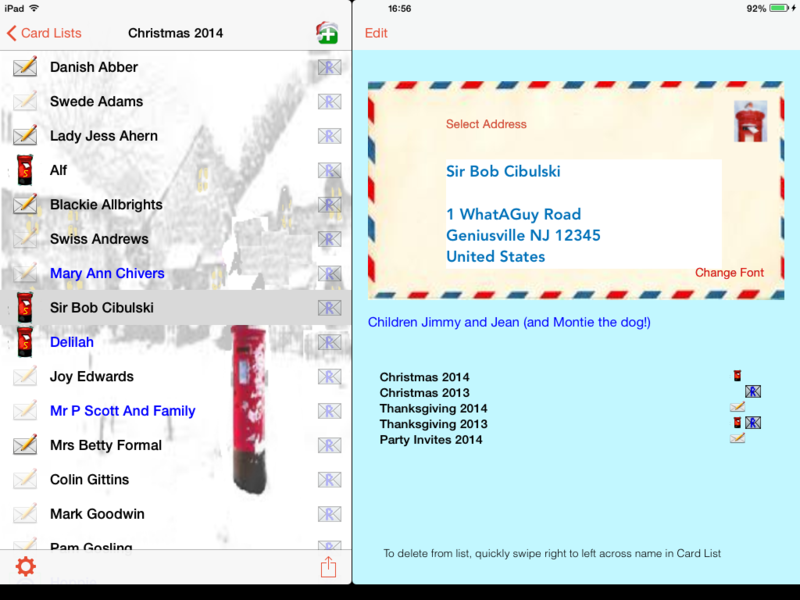 The app produces pdf files suitable for Letter and A4 sized address labels sheets. The names and addresses in this pdf file will line up exactly with the labels. However, the printer settings can change what the app has produced leading to problems. Have a look at Ensuring addresses fit inside labels for more information. You might be better emailing the labels to a computer and printing from there as it would give more control over the printer settings and tray etc. After backing up to Dropbox on iphone and trying to open on mac laptop for printing bc we don’t have an airdrop printer , my drop box file says empty. Also I’ve emailed the PDF several times and the email does not come through. The dropbox backup is used for 2 reasons – to ensure you never lose a list, and to copy to a different device. It is stored in a machine readable format – not as a file for printing. To email the pdf file, you have to use the inbuilt mechanism for that purpose. If this doesn’t work, check that email sending is working on your device. I just opened app and all contact lists have disappeared. Why? What can I do? Is there a way to keep track of how many international stamps are required? I always send several icards abroad and would like to know how many stamps I have to buy. Thanks! Hi Kristen – no there isn’t, but that is a good idea for a future version. Thanks. I have just got the app but wondered whether you could have a ‘sort’ based on the progress of the card. This way all my written and posted cards would appear at the top of the list. Also when completing a manual sort I found it reverted to unsorted when I made other edits to the list. Hi Julie. Looks like you are correct about the manual sort – I will fix that in the next update. Thanks for letting me know. That is a good suggestion about the sorting on written/mailed etc. I will have a look at that. By the way, if you tap in the search at the top, you can filter the list a little e.g. to show cards still to be mailed. Love this app. I am not able to use all the fonts listed. In fact it will only let me select a few, through trial and error. Any thoughts? Hi Sue – I think you also emailed me about this? What i think might be happening is this. The table of fonts lists them as families. Within each family are the actual fonts. For example, there is the “Arial” family, with members Arial-BoldItalicMT, Arial-BoldMT, Arial=italicMT and ArialMT. In the table, the family name – Arial, is in a Header for the family. It isn’t very distinct, but it does have a slightly darker background, than its members below. I think you mightt be tapping a Header, which will do nothing. You need to tap one of the font family members below. I hope that makes sense. Will this work on a MacBook Pro? From reading about the download, it sounds like it’s only for the iPhone or the iPad. Please let me know as soon as possible. Thank you! sorry – it is just for iPhone and iPad. I might write one for the mac though. I would like to us this on my MacBook Pro also! I am trying to import names from my contacts into my 2016 Christmas Card List. I was able to do it in 2014 when I first downloaded the app but now the only contact list that shows up is the last one I used in 2014, which has about 5 names in that group. I have a lot of contacts and several groups, so those 5 names are not my only contacts. I made sure that I have “allow access to my contacts” is turned on in my settings. I wasn’t able to use the app at all in 2015 because my 2014 list wouldn’t open up. No names showed and I had a complete list of people for cards in 2014. It didn’t work on my iPad or iPhone anymore. I even deleted the app and then downloaded it again and that didn’t work. I tried looking in Dropbox but the file wouldn’t open. So, I just got a brand new iPad and when I opened the app my card list was there, much to my surprise. So now I am trying to up date it for 2016 by adding names from my contacts as I mentioned at the beginning of this comment. Thank you for any help. Hi Virginia – sorry for all the problems you had. Are you saying that you have several groups in your contacts, but the app is only showing one of them? This was reported twice yesterday and is currently being investigated. I have been unable to get this to go wrong myself, making it hard to fix. However, I am doing my utmost to sort it. Please email support@ios.addresslabels.app as your input might help me in solving this. Thanks. This is now hopefully fixed in version 4.31 which went on to the app store today. Yes, thank you. That problem in the app is fixed since the newer version. Thank you so much! Can you copy and paste to another list. Are you sure you actually have groups in your Contacts i.e. when you open the Contacts app itself, do you see the groups? This is my second year using this app and it works well. Quick question, after choosing the addresses to be printed, it shows me a preview and the addresses line up differently on the different labels. Some are all the way to the left of the label, others are indented slightly, and a couple have the city, state & zip each on separate lines. Also, when I selected a font, it then proceeded to warn me that there were no addresses associated with the names. Of course I could see the addresses and I printed a sample page and it printed addresses. The labels work, I would like them to be consistent from label to label and am not sure why they aren’t, or how to fix this. I checked for an update and didn’t see one. Hi Monica. The app tries to centre the names and addresses in each label. They will look out of alignment relative to each other, but should look correct on the label itself. That is the intention anyway. I have heard one other person say about the warning about no addresses after changing font. I think they exited the app and restarted and could not get it to happen again. Do you get it each time? Would you like to email me about it (support@ios.addresslabels.app)? Greetings! We’ve just purchased the app and it’s looking great so far. Is there any way to share/collaborate? We have individual devices with different contact lists. Thanks & happy December! In theory, you could copy the lists from one device to another by the dropbox backup/restore facility if you logged onto both devices with the same dropbox account. However, if the lists use names and addresses from Contacts, and the Contacts are different, this would lead to problems. The app on the second device would not be able to find the names and addresses. Sorry, no suggestion just want to express my love for this app!! It really saved me as my computer wasn’t working for some reason. Thanks so much. Hi. Your app is great. I have not been able to print to Avery Labels before without problems (I have an iMac and a iPad), but that’s now in the past. I would like to print my return address on Avery Mini Labels, e.g. 65 labels per A4 sheet (so that I can use them on letters and cards to overseas addresses) but your app does not support Mini Labels. Is this something you would consider including in your app? Hi Diana – yes I will be looking at including these next year. Great program. A breeze to use once familiarised with it. Would it be possible to increase the print ratio to the size of label used? e.g. If I pick an A4 sheet of labels with say, 21 labels (3×7) then pick an A4 sheet with 8 labels (2×4) the print size as far as I can see stays the same. Am I missing a setting somewhere? Hi Rod. The text should change with label size. I just looked at the 4 x 2 and I think you are right – it isn’t making the text size increase. I will investigate this for a future update. Thanks for pointing that out. This looked like it was going to be great until I added all the addresses I needed just to find out there is no way to adjust the margins on the iPad. Hi Connie. It isn’t that you need to adjust the margins on your iPad. It is just you have to make sure your printer itself doesn’t add margins or do any scaling. Similarly, if you email the label information to your computer, you have to make sure the program on your computer doesn’t do any scaling or add margins. Would it be possible for the detail box to show the current font name. The choice is so wide and many fonts are so similar that I need to be sure which one I am using (in case I need to go back to it? That should be possible. I will put on my list of things to do. Thanks for the suggestion. Is there a way to add return labels? The next update (coming soon!) will add a Returns label feature. I have had mycardlist for two years. I notice that there are times when the prefix (Mr, Mrs) are not carried into mycardlist. There are also times when, once the labels are printed, the font on individual labels is smaller. Can you help? Please could you email me about the Mr and Mrs problem with more details e.g. is it when adding names just to myCardlists, or is it when importing names from Contacts? The app tries to use most of the label space with the name and address. Therefore, if the name and address is long, the font will be smaller. how do I remove a name from a list that has already been created? Just sweep across the name right to left and tap the red Delete box. It won’t delete when I press the red delete box. Love the app almost makes Christmas Card writing a pleasure! Would like to be able to print just one label but somewhere other than top left ( already used that one) any thoughts? That wouldn’t be possible at the moment. I will look into adding that to a future release. Thanks. This will be possible in the next update – coming soon! I used your app this year for my cards & it was wonderful! No more trying to figure out how to use mail merge in outlook, which took hours. Can I request that you make it available in other formats, android, windows, or possibly website based? I was looking at it for my mother to use, but she doesn’t have an iPad. Thanks. Thanks for that. I am starting to get a few requests for other formats. To be honest, I’m not sure whether to do this or not as it would be a lot of effort and I’m not sure how many people would actually pay for it?? I will consider it though. Hi, app is great! I have read in several reviews that you can update the actual iphone contact, and the data will be updated in the mycardlists application. But, I haven’t found that to be the case… ie I update the person’s mailing address in the Contacts application, and then in the current myCardLists list or when I import to a new list, the old address appears. I don’t understand why this isn’t working for you. You are running the app on your iPhone? If you change an address in Contacts, that new address should appear in myCardlists. In fact, myCardlists doesn’t store an address (if imported from Contacts), just an ID and its asks Contacts for the address. Are you sure you have created a second person of the same name, but with a different address? Cannot line up the the labels with my IPAD 2 !! I am using Ryman 2X7 labels per page. The problem will be with your printer settings. Please read the page about printing labels on the support site for more info. Hi. Is there a way to print the addresses directly to the envelopes, without labels? Or an export list function? Ni sorry not on to envelopes. I think this would be difficult as envelopes are all sorts of sizes. You can email the labels, or export to Dropbox, but that export is really just for myCardlists use. Is it possible to change the size of text please? Do you mean on the labels? No – it tries to adjust the text to fit the label. You can change the font though. Because it has applications beyond cards, I would like to be able to print all of the contact info. Can you make this possible? Hi Stan. What do you mean – on the labels? I’ve been looking for an app to print mailing labels ever since Avery discontinued their “Templates Everywhere” app. Yours is great. The one suggestion I have is, I would like to be able to import a GROUP (which I already have) from my Contacts. It would be much easier than showing the entire contact list and then ticking each person I want to add to the list. I already have my Christmas Card “group” in my Contacts app so I’d like to just import that. Thanks for the suggestion. Yes I will consider doing this next year. Hi Nikki. Thanks for the suggestion. You can import all of one list into another and delete the ones you don’t want. I appreciate that this isn’t very useful if you only want a small number of the ones imported. PLEASE can we have this app for Android?! I’ve looked everywhere for something similar and can find nothing that will do the job. That’s interesting. Unfortunately I don’t know anything about Android programming. On the other hand, perhaps I should learn! Thanks for the suggestion – I’ll consider that for next year. 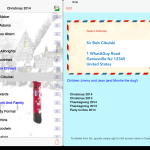 Great app, Christmas card labels done in no time at all; but I was disappointed that the background did not print on the labels. That would have been great. Thanks. I might look at this in the future, although I know not everyone would want it, and others might want just part of the label to have an image. I need to be careful not to complicate the use of the app with too many options etc. Anyway, glad the app has been of some use. I have just purchased your ap and typed in all Christmas card addresses randomly and thought I would be able to sort them into alphabetical order by surname. Is there any way to do this? Glad to report that this morning when I opened the ap all addresses were in order. Don’t know what was wrong but all ok now. Have printed off both address and name lists. Very happy with the ap and looking forward to making the chore of addressing the Christmas card envelopes much easier. Excellent – thanks for letting me know. Would be great to have more sorting options on the card list. 1) Sort by “contact” insted of card name. This is especially important when you charge the card name to something like “The Arnold Family.” When you do that it either gets sorted with the “T” for The or “F” for Family. Would be great if it was sorted by “A” for Arnold. Thanks – I think those are excellent suggestions. I’m not so sure about the sorting by Contact name, but I wouldn’t discount it. The problem would be that the use sees the Card Names and sorting on Contact name might look wrong. I have put things in such that “Mr and Mrs John Smith” and “Dr. Anne White” would get sorted on J/S and A/W respectively. i.e. it takes account of the “Mr and Mrs” and “Dr” as not being part of the actual name. Perhaps I could do the same with “The” and “Family”. I will certainly give this a lot of thought. The idea about sorting on Sent/Received is great. I’m not sure how to design the interface for this, especially on a smaller iPhone, but I am sure there is a way. This a excellent suggestion, as I too found the same issue when changing the card name to The …. Family & would love my list to still be alphabetical!! Yes these two formats are supported – just choose any of the 10×3 Letter formats. When I originally added the labels feature to the app, I expected there to be a subtle difference between the different types of say 10×3 label, and I added all of the ones I checked to the list. However, I eventually found that the dimensions were always the same. I do wonder if I should change the app to just display “10×3 Letter”, “8×3 A4″ and so on. I have had users confused though – for example, even if a label format is in the list, such as 5160, because it says “Letter 10×3 5160″, some users thought the support wasn’t there. So either I could go on adding different flavours of the same label size to the list, or I could simplify the list by just putting the 10×3, 7×2 etc. and page size – Letter/A4. Not sure what would be easiest for most users?? The first field in quotes would be imported as the name and the other fields as the lines of the address. This would save a lot of retyping for me if I could just export the data from Excel or Access say to the Dropbox backup area and then the app would create a list by importing the data. That is a good idea. However, I’m not exactly sure how to implement it. For a csv to work, I think I would need to know how many fields there are, and they might not be the same – different in different countries, and even in the same country, there can be more than one street name, county could be left out etc. I could stipulate a number of fields and the user would have to leave blanks e.g. “John Smith”, “1 High Street”, London”, , , , but then this might not suit all applications etc. It would be nice to not have to rekey all the names and addresses that are on an excel spreadsheet. That’s a good idea. I’m not sure I could implement it though as there would be so many different ways that people could create their spreadsheet i.e. how would the app know where to find each name and address? Could do with more details about this. Please could you email the support site so that we can discuss it. Thanks. I like the sounds of your app; however, I believe when printing out a list it will only print card status. I am also looking for an address book that I can print along with any notes I would store i.e., phone #’s, email addresses, etc. Does this app have the capability of printing an entire list of all contacts along with the notes associated with each contact? Hi – sorry but your message was treated as spam! No, at the moment, you can either print the list of names (with card status) or all of the names and addresses for address labels. I LOVE this app!!! It has made Christmas so much easier because I’m not spending days organizing my lists, printing labels, etc. I’ve used this app the last two years and I love everything about it. I did have one little glitch when I switched from an iPad2 to iPad Air and I contected the developer who was extremely responsive and helpful. As it turns out, the glitch was not with the app but in iCloud. Great job and thanks very much for developing this awesome five-star app.